After this I took the subway back to Shinsaibashi for some last minute shopping before heading back to Namba for the final lunch of the trip. I thought I’d push the boat out a bit so had a bit of a feast! udon noodles with seaweed and a fried japanese plum followed by chicken, onions and rice and some japanese pickles. All very nice it was too! I’m just about to head back to pick up my bags and make my way out to the airport. Thanks again for accompanying me on this trip! I’m looking forward to sharing my photos with you when I get back. Well, that’s it for another trip. I leave the apartment in an hour, then leave the country 12 hours later. It’s been a great trip, especially as I wasn’t 100% sure about even making it right up until I boarded the plane in Glasgow. Japan never ceases to impress and confuse in equal amounts. 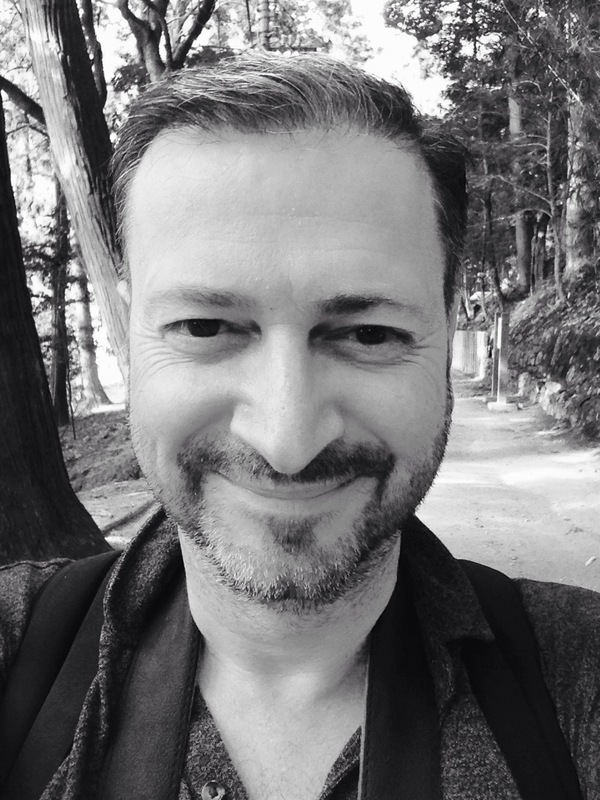 I’ve learned a lot this visit, about Japan and about myself, mainly because doing it alone has meant no place to hide… I’ve had no choice but to get stuck in, speak the language, and get involved. That part has been great. After my first visit a few years ago I became fascinated with Japan’s cultural obsession with the changing seasons, something I’ve always been interested in as a photographer back in Scotland, so I decided I’d like to produce a book of photos of Japan in all four seasons, if I could. Since then that idea has expanded to include a comparison with Scotland’s attitudes to the changing seasons and how in many ways our seasons are similar but our attitudes to them are totally different. With every visit my plans for the book change, the ideas I have now are certainly different from what I had in mind when I left last summer and I’ve no doubt that they’ll change again next time I visit. Winter will be interesting. Osaka is quite far south so to capture some truly wintery (snowy) scenes I may need to visit Hokkaido in the north. Moving away from my comfort zone here in Osaka will bring a whole new set of problems I’m sure. Spring with its fleeting Sakura season is famously brief, sometimes only lasting a week or two – and extremely busy – so that visit will require a lot of planning to make sure I don’t miss the cherry blossoms, but also, that I have a place to stay while I’m here! I’ll have to juggle probable dates for the Sakura several months in advance to have any hope of getting accommodation in what is arguably the busiest time of the year for tourism. But that’s all in the future. Stay tuned to my facebook and Twitter pages to see the results of this visit over the coming weeks. Apologies in advance for the huge number of garden images, for the orange, red and golden leaves and for the moody cemetary shots! 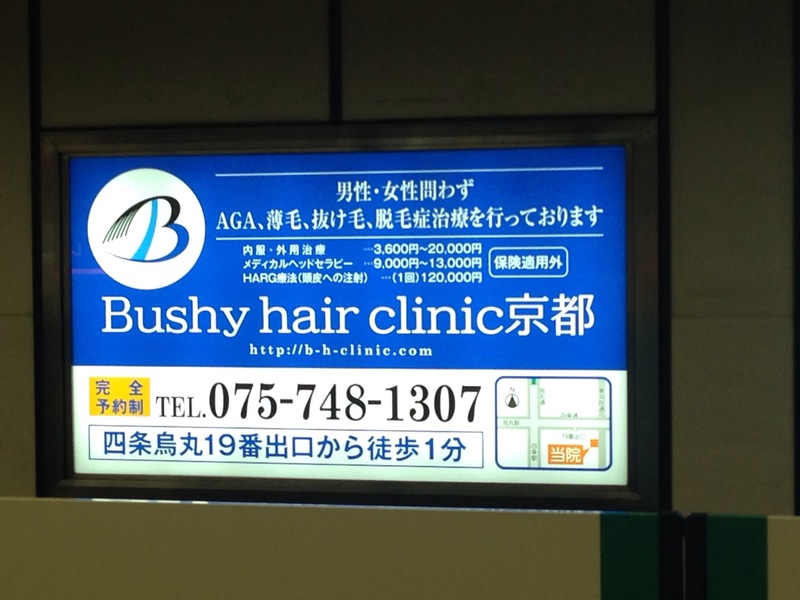 is this an ad for people who have bushy hair but don’t want it; for people who want it but don’t have it; or it just an ad for a hair clinic run by Dr Bushy?! I have no idea!! I was walking through Shinsaibashi earlier when I noticed a policeman running towards me. The guy must have covered 100m at full sprint before he caught up the culprit who was casually standing still just behind me, a shady fellow if ever ive seen one, just having a cigarette. The officer quickly pointed out he was smoking in a no smoking zone… Honestly. The policeman was so concerned for the rest of us breathing in second hand smoke he was prepared to run full speed for 100m to stop it! Back in Glasgow I’m sure some of our finest would turn a blind eye to murder if it was happening during their coffee break!! The best thing was the reaction of this criminal… After the error of his ways had been pointed out, the hoodlum immediately put out the cigarette and bowed respectfully to the officer!! Again, I’m fairly confident that wouldn’t be the reaction back in the west! It just summed up for me the attitude of the Japanese when it comes to following the rules and respecting others. I’ve never experienced anything but honesty and friendliness here and never felt threatened in any way. Anyway, about the photos! Today was my last full day in Japan so after the series of blunders yesterday I was determined to make the most of the day. Thankfully the weather had improved; high cloud with the occasional burst of bright sunlight – perfect for photography. As per my plan, I headed off to Umeda again, onto the train towards Kyoto but got off at Karasuma then a short walk to Shijo underground station for the underground to Keage, changing trains at Karasuma Oike. I managed to grab a few shots in the traditional garden (example above) so look out for them when I get back home! After Konchi-in it was just along the road to my next stop, Nanzen-ji, a former palace made into a temple in 1291, which houses another stunning temple and garden complex. 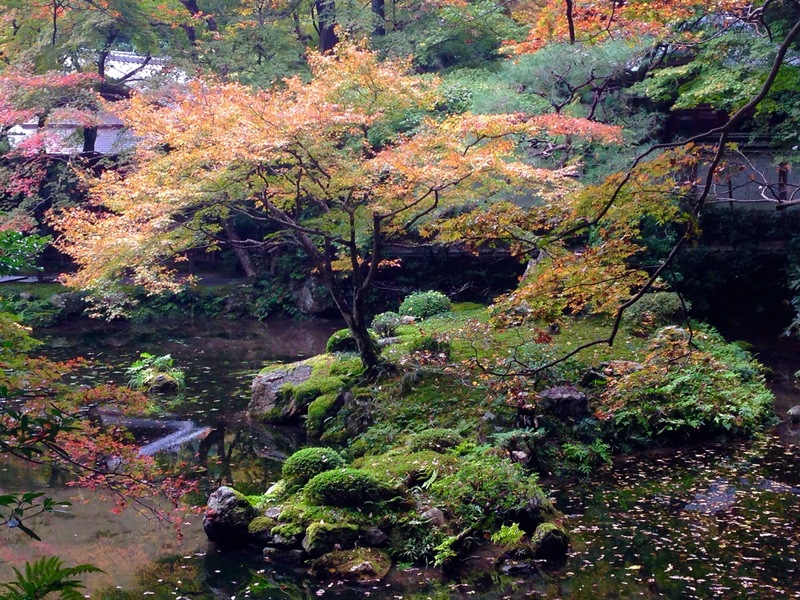 The Nanzen-in garden was beautiful and with no limitations on photography I managed to grab quite a lot here! 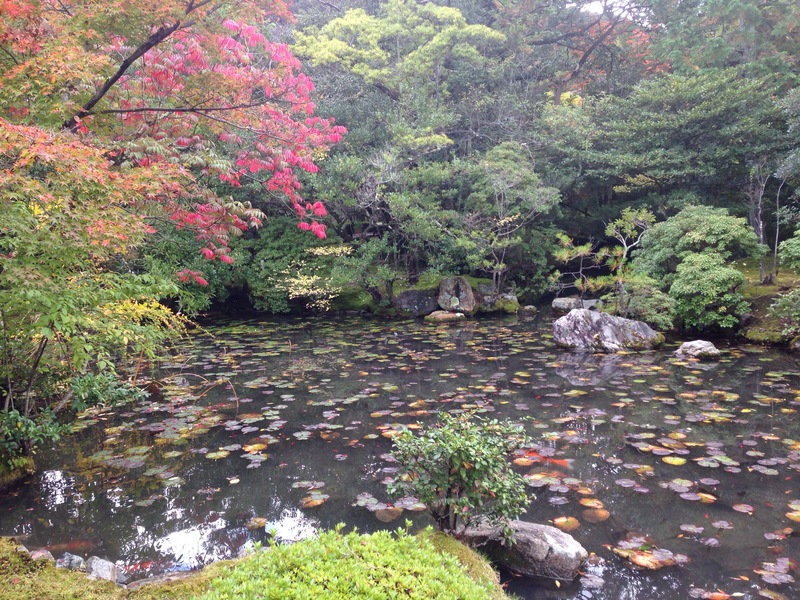 Ginkaku-ji or as it’s better known “Temple of the silver pavilion” or by its more poetic and official name, Jisho-ji “Temple of Shining Mercy” is a Zen temple approximately 2 miles further along the Philosphers path. 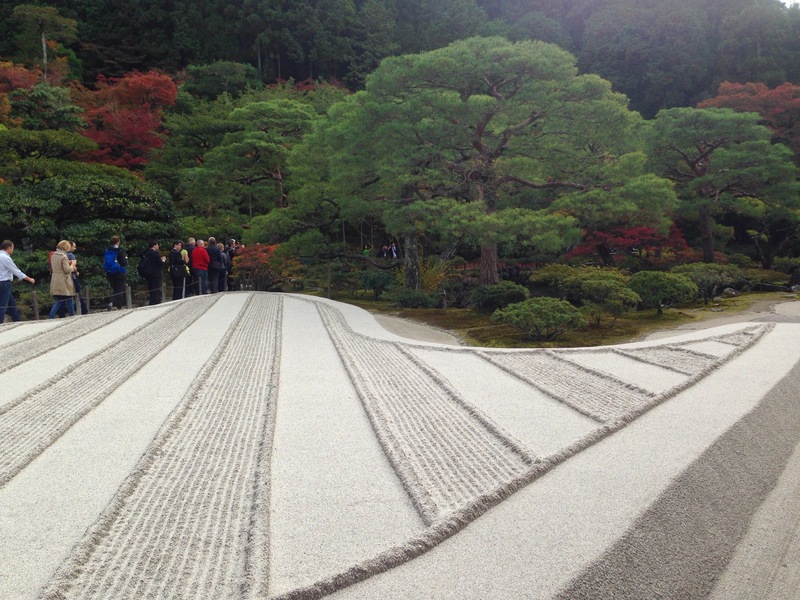 The Zen garden was incredible at Ginkaku-ji but the whole site, as its a famous world heritage site, was very very busy. I’m sure there will be people in all of my shots, so a fair bit of editing required to make the images useable. 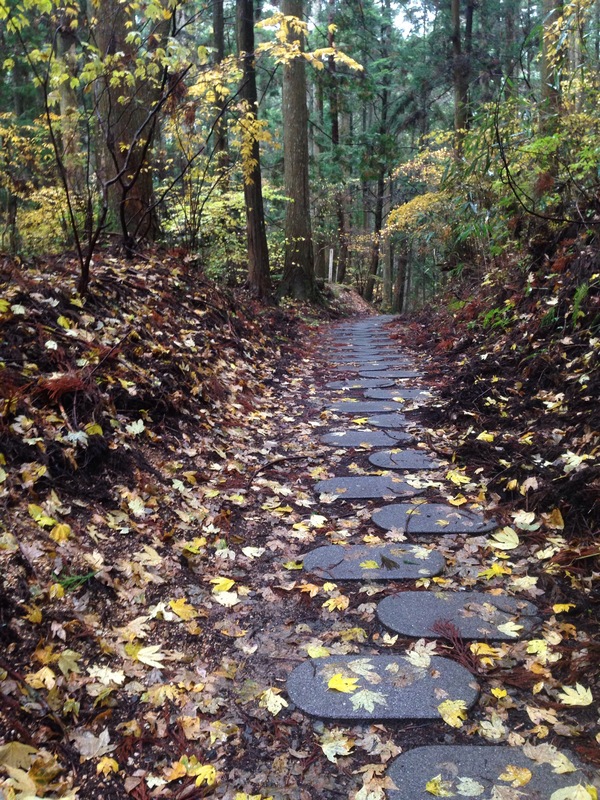 For some reason, the forests around the Fushimi Anari shrine aren’t showing a lot of signs of autumn just yet. After a wander around the shrines it was back on the train to Kyoto and then onwards to Osaka. I reckon I’ve walked between 60 and 70 miles over the last 8 days, all the time carrying my camera gear which weighs 10kg. My feet feel like it’s been more though! Two guys, mid 20s, one English and one Australian, nearing the end of the cherry-tree lined path, just in front of me.. Sorry autumn started before you got here guys! Bit of a frustrating wash out today I’m afraid. Much like I believe it’s been back home in Scotland? I spent the day chasing the weather and good light and ended up with not much to show for it. I woke early with the intention of going to Kyoto to do the philosophers walk but the rain was torrential in Osaka and the thought of going all that way just to get soaked wasnt very appealing, so I went instead to umeda for a wander around and to see if there was anything worth shooting there. I should explain. 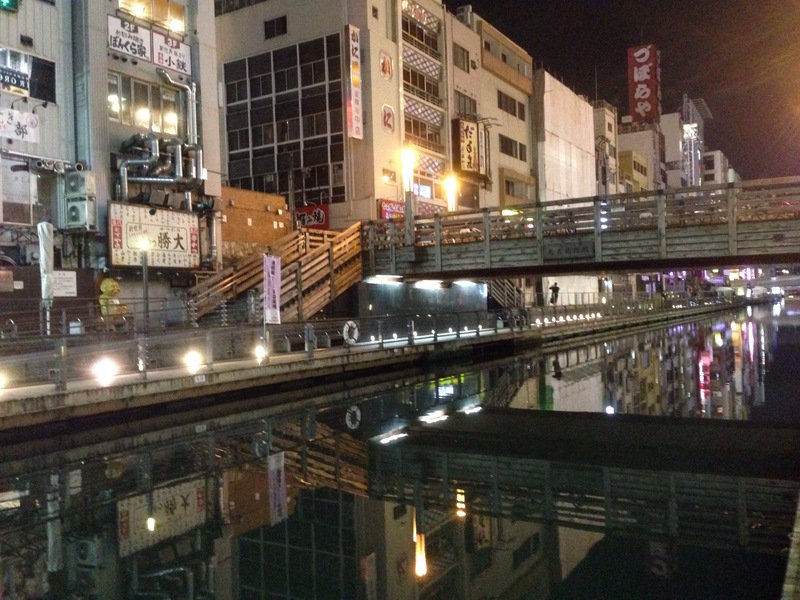 Osaka has two main centres, Kita-ku which is in the north and Minami, to the south. Each district has its own shopping and entertainment districts: in the north it’s Umeda, to the south, where I’m based, it’s Namba. 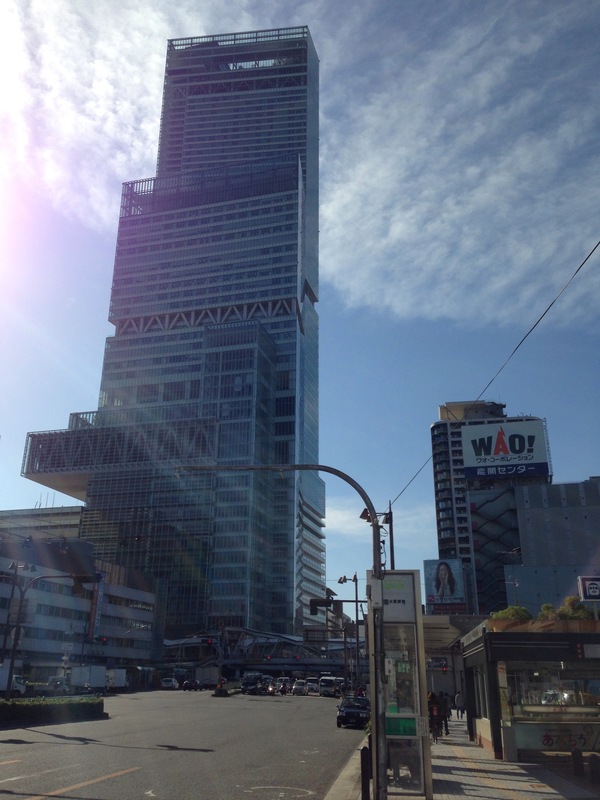 Everytime I’ve visited Japan so far I’ve been based around Namba so while I’ve been to Umeda many times (the main rail hubs are there) I haven’t really explored it like I have Namba. So, off I went in the hope of doing some wet street photography only to find when I arrived that the rain has gone off so my planned theme of seas of umbrellas and neon lights wasn’t going to work! 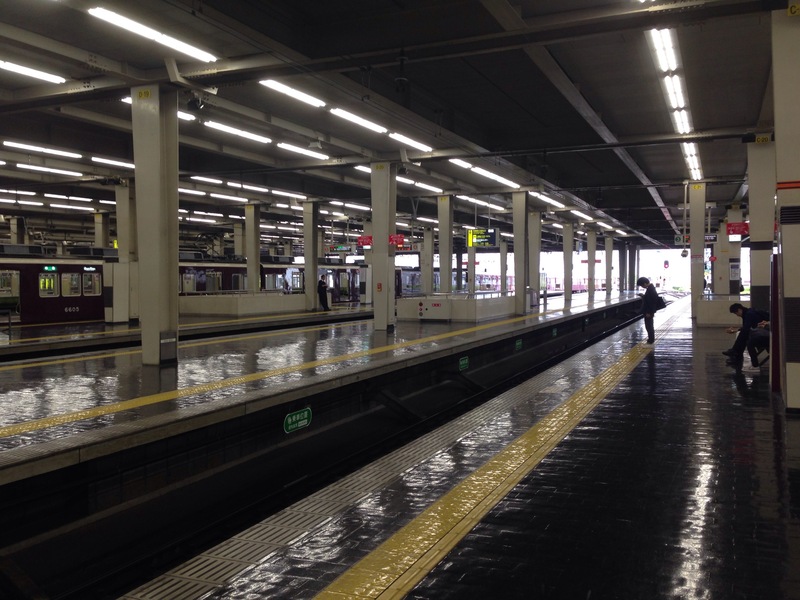 I spent an hour or so in Umeda anyway and wih the weather seemly improving I decided to brave it and head to Kyoto. 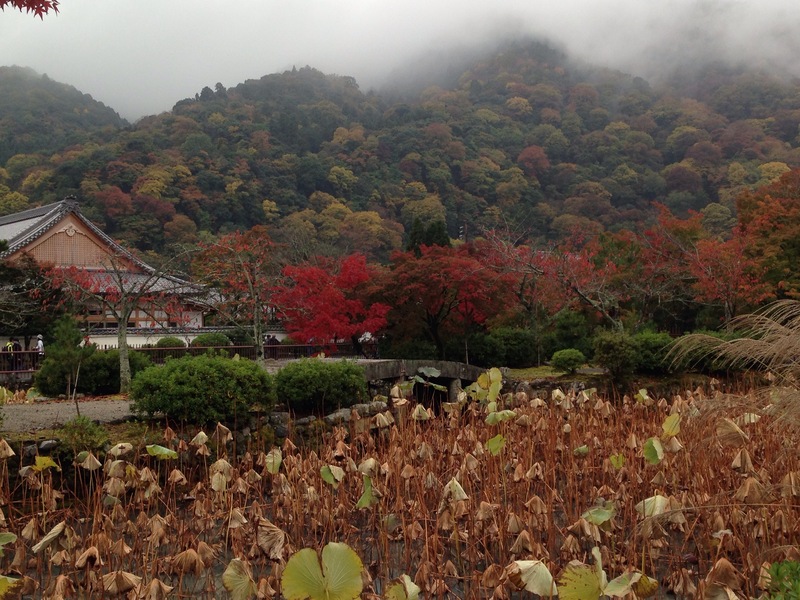 As I approached the outskirts of Kyoto it became very clear (or unclear!) that the weather in Kyoto is not always the same as in Osaka because as the train approached we were smothered in a thick, and thickening, fog. In hindsight I should have continued on to Kyoto but I had an idea that the bamboo groves of Arashiyama would look great in the fog, so hoping off the train at Katsura I caught the connecting train for the 8 minute trip to Arishiyama. Only to find… No fog, just a faint mist covering the top of Mount Arishi, so I grabbed a few photos and headed back towards Kyoto thinking that plan B could include some temples in the fog instead. Only to find… Yep… the fog had gone and instead it was now bucketing down with rain again!! Yep… you’re way ahead of me now… It was brightening up now in Osaka. I took a few shots for future reference anyway but with none of my plans working out today, it ended with me a tad annoyed and frustrated. 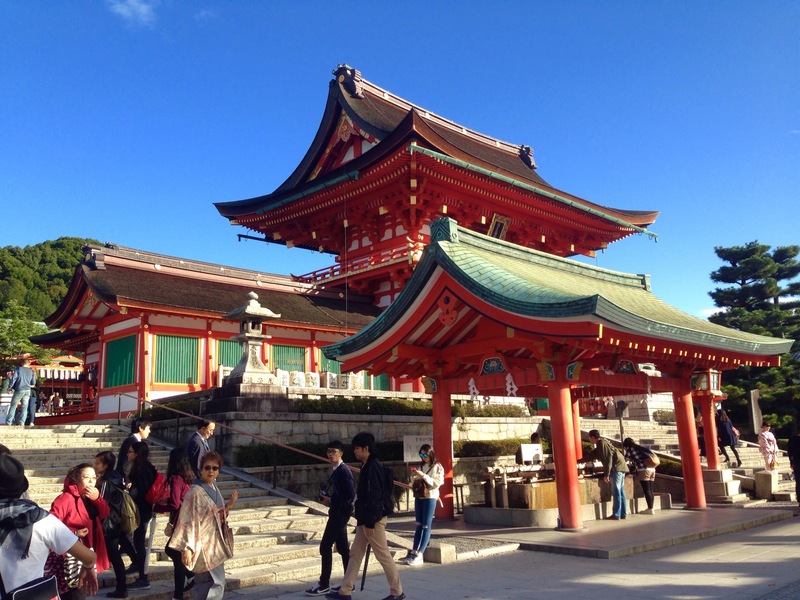 The plan for tomorrow is back to Kyoto, do the philosophers walk, see the silver pavilion, pop out to Fushimi Inari and be back at Gion for Geisha time! Hopefully the weather will be better then!! I woke this morning to heavy rain. Kinda like the rain we get in Scotland only warm. I thought it was rather pleasant as I walked to the local 7-11 for some breakfast; like having a warm shower with your clothes on, but the locals clearly thought I’d lost it as I casually strolled through the downpour in a t-shirt and jeans while they all had waterproof clothes and umbrellas! I had pencilled in a trip to Mount Koya, or Koyasan as its also known, today but the torrential rain was making me doubt the decision. Rain at sea level may be pleasant but at 3000 ft up a mountain it might not be quite as nice. Walking through Japans largest graveyard in a forest, 3000 ft up a mountain, in the rain, might not be everyone’s cup of tea, but doing it all in a thunderstorm! Who wouldn’t jump at that!? So, off I set towards Koyasan hopeful of some lightening strikes to make for some dramatic photos. 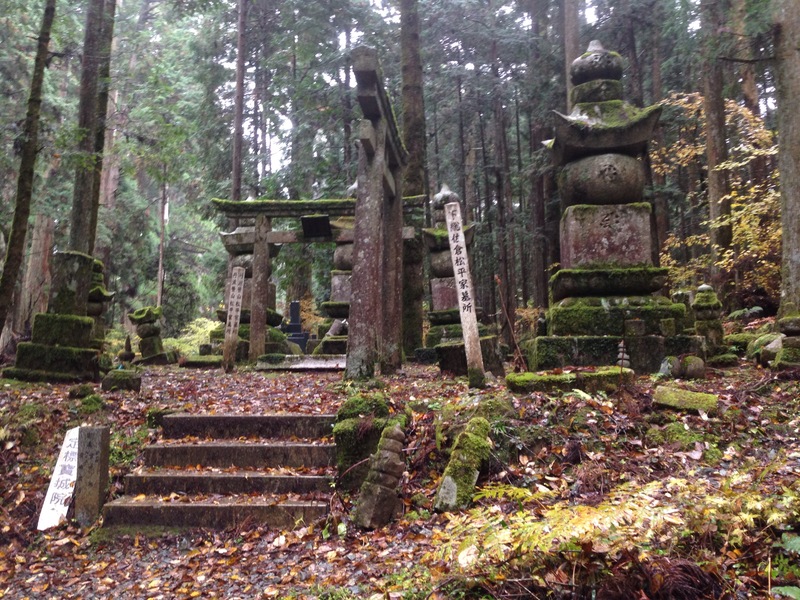 Okunoin has more than 200,000 tombs. TWO HUNDRED THOUSAND tombs!! The thunder didn’t arrive but I’m so glad I went today. The combination of autumnal colours, the rain and the atmosphere of the place made for what I hope will be some very moody, atmospheric photos. 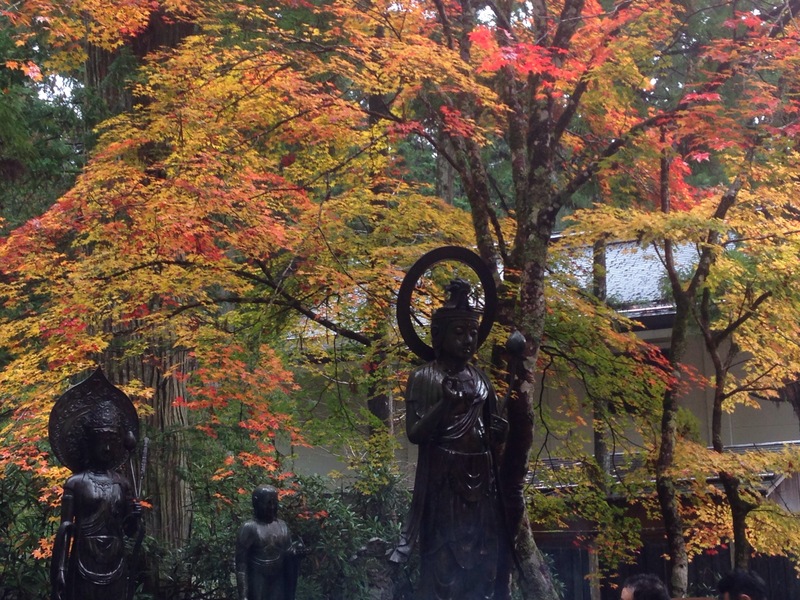 I’ve been to Okunoin twice before and loved the place, but today in the mist, just watching leaves fall from the high cedar trees and silently settling on pathways and tombs, some of which date back to the early 1100’s was magical. I spent several hours there, exploring parts of the forest id never seen before, usually on my own as most visitors keep to the well defined pilgrims path. One risk from leaving the beaten track is that you’re more likely to walk face first into a giant tree spider’s web, which I just narrowly avoided (complete with spider) when I turned, not looking where I was going for a second only to stop inches from the web and its occupier!! I’m not too proud to tell you that I screamed like a little girl before lurching back and narrowly avoiding a second one! I had an image of me leaving the forest like Indiana Jones on his way out of the temple of doom but with no one to brush them off for me!! Needless to say i made a speedy retreat back to the path after that! 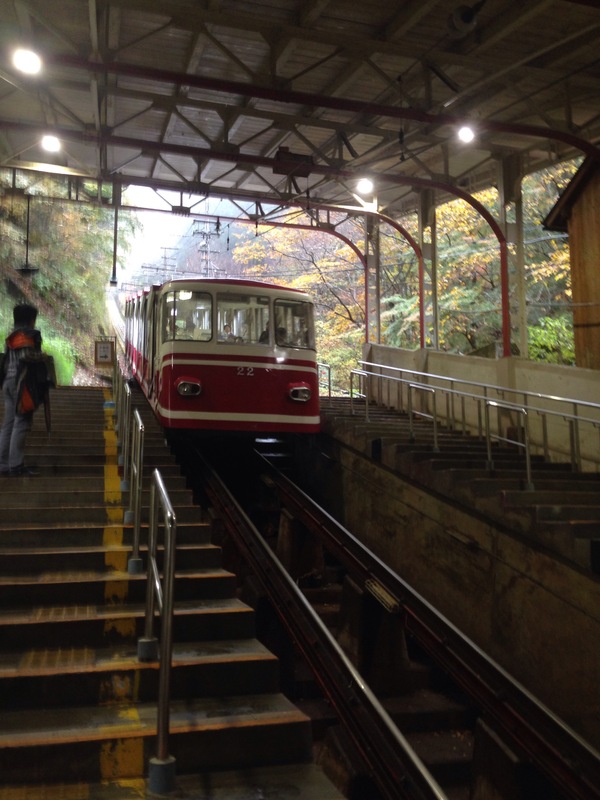 The other scare was when I stopped again at Sugatami-no-ido, the reflection well. Last year I did it with no problems, so I casually wandered over today and glanced into the water only to see… Nothing! There was water, I could see the trees behind me but just darkness where I should have been. I convinced myself that it was just bad light and shuffled slightly to the left and there i was! I’m not sure how these legends work, is it first answer only, or can you make an adjustment and try again, or maybe it was just warning me if I don’t make some adjustments I’ll be dead in 3 years!? Anyway, I’m off to Kyoto tomorrow (while I still have time!) to visit the silver pavilion, walk the philosophers path and do some more shopping. If the weather is nice I may even have another go at Meiko / Geisha spotting! Not much photography news to report today as this was my day off. 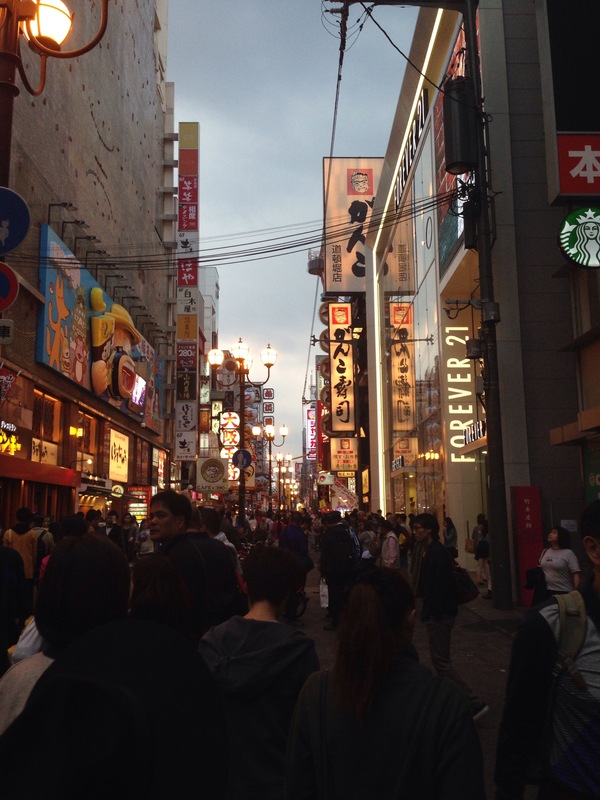 Spent most of it shopping around Den Den, Shinsaibashi and Namba parks. After a tempura, rice and soup lunch near Dotonburi I wandered over to Americamura to chill out for a while and watch the world go by. I did a little street photography on the walk back from Americamura to my apartment, and explored some parts of Osaka that I hadn’t visited before. After a nice meal of raw salmon and rice, I settled down for an early night. Batteries recharged (literally and metaphorically) I’m all set for tomorrow’s trip! I had scheduled a visit to koyasan for tomorrow but it’s raining just now and the forecast isn’t looking great for tomorrow, so I may switch my plans around, do the philosphers walk and the silver pavilion in Kyoto tomorrow in the rain, and leave Koyasan for Monday instead. It was inevitable I guess, with all my late nights and early starts… I slept in for my trip to Kobe, himeji and mount shosha. Not by much, but, given the fact it was a 5 hr round trip just to get to Himeji, the lost time meant I had to drop one of the three locations. As Id never been to any of them and had no idea what to expect, I dropped Kobe from the plan just because it “sounded” less photogenic. I still saw it, just briefly as the train sped through on its way to Himeji. Himeji is a lovely town! 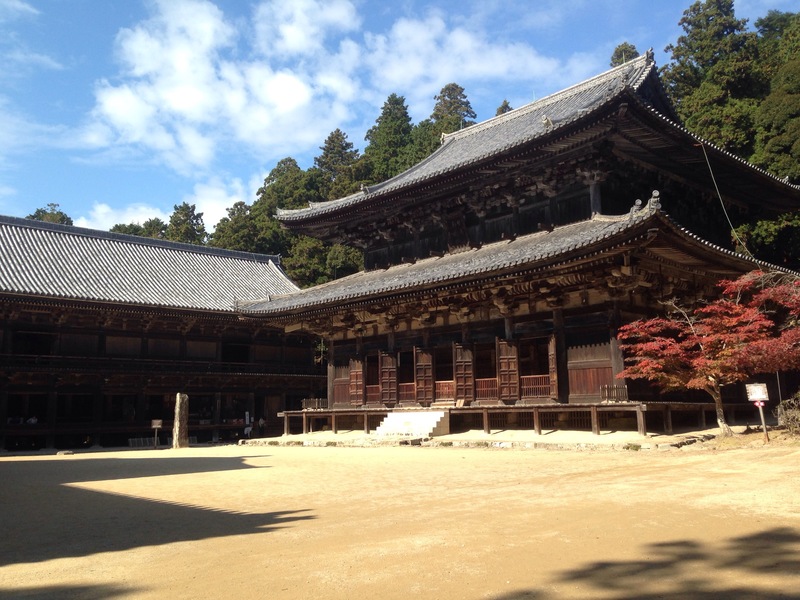 Far enough away from kyoto and osaka to feel a bit more “traditional” but still tourist friendly, easy to get around and well worth the visit. I’ll definitely return to Himeji as there was so much I didn’t get to see. All the travelling was worth it as the temple complex, the mountain paths and the views make mount shosha a brilliant day out. I decided instead to have a wander around the shops before boarding the train for the long trip back to Osaka. I have Saturday free for shopping and to chill out so my Friday night was also “free” as I didn’t have to worry about an early start. A few beers in hommachi ended up being lots more, with jaeger shots, in Shinsaibashi. I impressed myself by walking, slightly the worse for wear, all the way back from americamura to my apartment at 4am! It would appear I really do know osaka well now! Finally, after my rant yesterday about selfies, I decided to knock the chip off my shoulder, and stop being so judgemental.